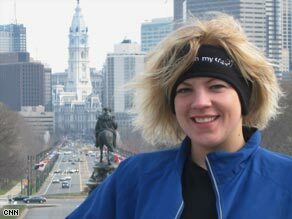 After contacting shelter, Anne Mahlum started running club "Back On My Feet"
PHILADELPHIA, Pennsylvania (CNN) -- At 5 a.m. on any given day, Anne Mahlum could be found running the dark streets of Philadelphia -- with homeless men cheering her on as she passed their shelter. But one morning last spring, she stopped in her tracks. "Running really is a metaphor for life," Anne Mahlum says. "You just have to take it one step at a time." "Why am I running past these guys?" recalls Mahlum, 27. "I'm moving my life forward every day -- and these guys are standing in the same spot." Instead of continuing to pass them by, the veteran marathoner sprang into action so they could join her. She contacted the shelter, got donations of running gear, and in July 2007 the "Back On My Feet" running club hit the streets. Requirements for shelter residents to join are simple -- they must live in an affiliated facility and be clean and sober for 30 days. Members receive new shoes and running clothes, and teams run together three times a week between 5:30 and 6 a.m. The runners are diverse -- doctors, janitors, students and shelter residents -- but such distinctions aren't apparent. "All you can tell is who's the fastest," says Mahlum. "You can't tell who's homeless and who's not." Runners greet each other with hugs and words of encouragement. While members say they've lost weight, quit smoking and have more energy, Mahlum believes they're also learning important life skills such as discipline and goal-setting that can help them get on the road to self-sufficiency. "Running really is a metaphor for life," she says. "There is always another mile. You just have to take it one step at a time." That's something Mahlum herself has learned over the past 10 years as she's dealt with her father's alcoholism. Running has been her therapy, she says. Back On My Feet also has a job training program for a partner. Three members are taking classes, learning computer and interview skills, while three others have found jobs. "Anne is helping people see the hero in themselves," says Solomon. Mahlum aims to have Back On My Feet in 10 local shelters by the end of the year and expand beyond Philadelphia in 2009. She believes her approach could be part of a solution to homelessness. "Do we need homes? Yes. We need jobs? Yes," she says. "But imagine if you didn't have anybody in your life who said, 'I'm really proud of you.' Back On My Feet does just that."